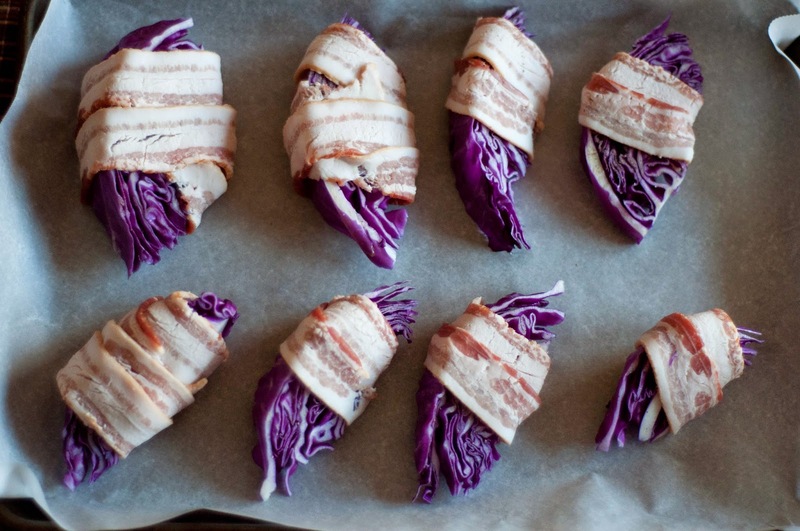 I'm a believer that things are better wrapped in bacon, and cabbage is no exception. I love the crunchiness of cabbage and that it's so beautiful growing in the field. A fun farming fact about cabbage: when planting green and red cabbage it is a rule of thumb to always plant 4 to 5 times more green cabbages then red. 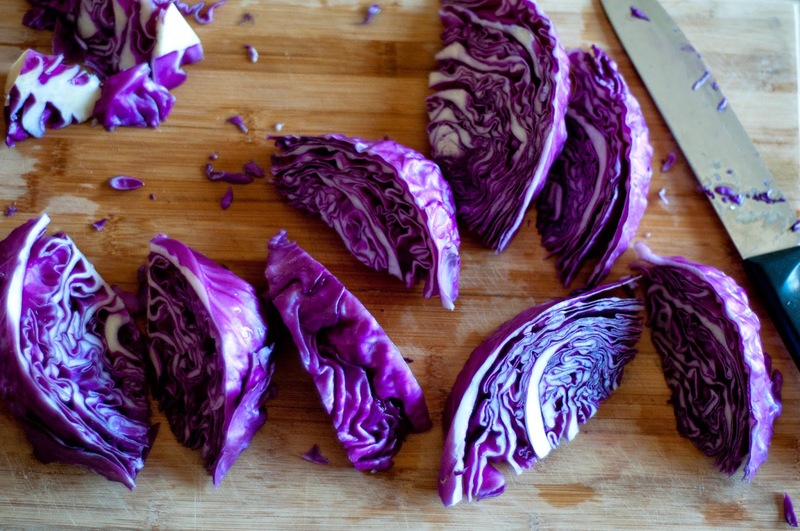 Where's the love for red cabbage?! I eat a lot of cabbage...I consider myself a bit of a coleslaw connoisseur. I have however, noticed that there are a good many people that do not share my passion for coleslaw. So this one's for you my friends. This a sure to be a crowd pleasing side item. Preheat oven to 425 and wash your cabbage. Slice it in half, half again, and half again....and if you're brave and have a sharp knife half again. So you'll have either 8 or 16 cabbage wedges. Sprinkle wedges with salt and pepper. Drizzle very lightly with olive oil. Now get wrapping. If you're going with 8 wedges will you need 2 slices of bacon per wedge if you have 16, you'll only need 1 slice of bacon. Notice below, in the picture some are big wedges (8's) and some are small (16's). Bake for about 40 minutes. 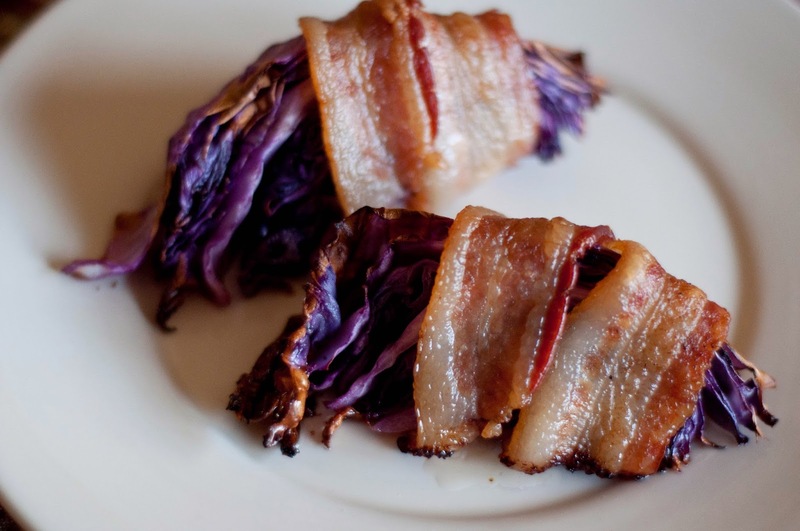 You'll want the cabbage to be tender and the bacon to be cooked. Eat asap when it's warm and delicious!